Join Us (& Billy Crystal, Meg Ryan, Jeff Goldblum) at the 10th Annual TCM Film Festival! The Turner Classic Film Festival is what we call “our favorite time of the year.” It’s got a flavor more special than any other film festival: every movie is a winner. This year, I’m proud to announce I’ll be back at the festival as a special guest and I hope you’ll join me! I’m introducing a nitrate print of the Cary Grant-Shirley Temple-Myrna Loy comedy The Bachelor and the Bobby-Soxer (1947) on opening night. Do the Right Thing (1989) will be commemorating its 30th Anniversary as well with a discussion that includes Joie Lee, who is in the film and is the sister of Spike Lee. Escape from New York (1981) with Kurt Russell and John Carpenter discussing the film beforehand. Out of Africa (1985) with a pre-film discussion with the daughters of the film’s late director Sydney Pollack. Raiders of the Lost Ark (1981) with a discussion with the film’s sound editor and visual effects artist. 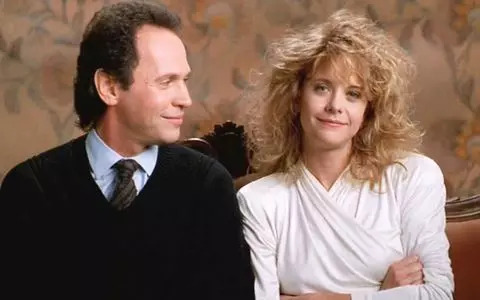 Steel Magnolias (1989) in its 30th Anniversary retrospective with the writer of the hit play Robert Harling. Working Girl (1988) with a discussion with that film’s casting director. July 13, 1985: where were you? Without knowing you personally, I know that sometime during that day, maybe for one minute, or maybe for an hour, or maybe all day, you were plopped in front of a TV set. You were watching Live Aid, a massive concert performed in various countries with the most famous and celebrated music acts, as it was being broadcast on TV. This was the massive concert organized by Brit artist/producer Bob Geldof to raise money to feed those starving in Africa due to a widespread famine (it occurred seven months after his wildly successful Band-Aid holiday single, “Do They Know It’s Christmas?”) and an estimated 1.5 billion people across 110 countries watched it. The next question: which performances stand out? Let me guess: at least one group you remembered was Queen. Bohemian Rhapsody is made in 2018, but it’s an ’80s movie, no doubt. The film opens and ends at Wembley Stadium for Queen’s reunion performance at Live Aid in which Freddie Mercury energetically stole the show. The movie is a trip down memory lane, but it also fills in a lot of blanks. Kids in the 1970s were always singing “We Will Rock You/We are the Champions.” I specifically recall one of these moments when I was 7, propped on top of my backyard monkey bars, and learning the band who sang the anthem was named Queen. I was confused, and I asked: “Is there a girl in the group? If it’s all men, why wouldn’t they name the band King?” The answer I received was a shrug. Twenty years later, after the passing of Queen’s lead singer Freddie Mercury from AIDS, I finally understood (or thought I did) the name: Aha! I get it! And, then assumed everyone in the band was gay. Only now, 40 years after I first pondered that question, and having seen Bohemian Rhapsody, do I finally understand the moniker. I grew up with the music of Queen but the band members weren’t too much on my radar – no more than the artists who made up Toto or ELO. I remember the “Is He Gay?” speculation of Elton John (yes), Boy George (oh, yes), George Michael (OF COURSE…oh wait, I guess not…oh, scratch that, TOTALLY), and the rumored tryst of “Dancing in the Streets” duo Mick Jagger and David Bowie (who cares?). Freddie Mercury was someone I was aware of, but didn’t occupy much of my thoughts – and certainly didn’t care if he was or wasn’t gay. But now, knowing a little more of Mercury’s outrageous personality and the phenomenal, original music that stands the test of time, the idea of watching a band biopic is absolutely mouth-watering and I couldn’t wait to see it. And then, I did. The reality is that the film is interesting and well worth seeing, but don’t expect to feel a deep connection with the story, the band, or Mercury. It reminded me most of Mamma Mia!, where you feel fulfilled by hearing all the music you love, yet the storyline feels shallow, even though it’s trying so hard to give you depth. But still, you recommend it to your friends. If it comes on TV, you leave it on. It’s satisfying, even if it isn’t all that you hoped. The journey of Bohemian Rhapsody begins with a young Parsi Brit with a mouth full of teeth named Farrokh Balsara. He’s a Heathrow Airport employee already full of swagger. When he introduces himself to Smile, a local band he’s taken a liking to, they quickly join up. From there, everything seems to move so fast, it’s hard to gauge time and if the group struggled at all as a musical act or was an instant success. Zoom, zoom, zoom – the film is 2 hours and 15 minutes, so it’s understandable a lot had to go, but what it loses is the heart, the understanding, the relatability, and the connection the audience so wants to experience. The film centers on Freddie Mercury who knows exactly who he is professionally but is searching for his identity on a personal level. Rami Malek falls into the trap of playing a well-known personality – he does a killer impression of the Freddie Mercury persona yet doesn’t quite capture Mercury’s spirit. On the other hand, Gwilym Lee NAILS EVERYTHING about lead guitarist Brian May, it’s almost an uncanny valley: he looks, moves, and speaks absolutely identically to May. The end result is learning how it all came to be, the creative genius of Queen’s timeless music, and witnessing the original thinking so many others have copied since. Kudos for showing that Queen wasn’t all Mercury – it was a group effort and they are reflected as equal contributors who get plenty of screen time. Bohemian Rhapsody was a long road with directors and talent signing up and falling out, including director Bryan Singer being fired halfway through filming and Dexter Fletcher (who directed the heartwarming Eddie the Eagle) hired to salvage it. It seems that making the film about Queen was as much of a beautiful mess as the band themselves. And like Freddie Mercury, the film isn’t perfect, but it has an amazing range and hits all the high notes. 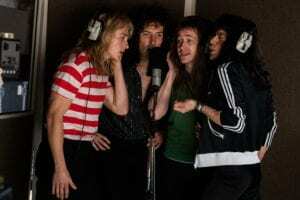 Bohemian Rhapsody opens on Nov. 2.